I recognize two people in this 1924 photograph. 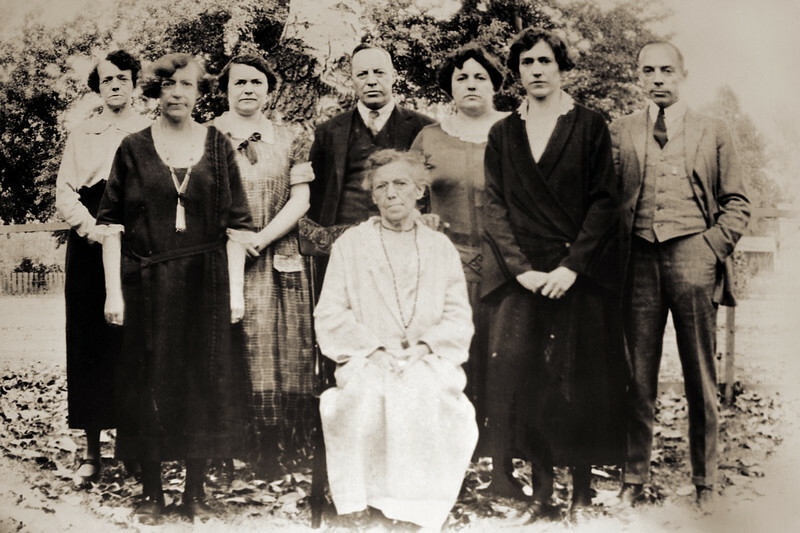 The second woman from the left with a white tassel necklace is my great-grandmother Minner Raver and the man on the far right is her brother Bill. I suspect the woman seated in the middle of the group is Minnie's mother Elizabeth Fulk. If so this is the best picture I have found of this great-great-grandmother. Elizabeth died in 1925 so this would have been one of the last pictures of her. I know this photograph mattered to my great-grandmother because she put it in a curved oval frame and hung it on her walls for many years. I recovered the curved print from my mother's collection and snapped a few macro shots of it today. The image is still curved and cannot be scanned with a flatbed. It's in poor shape and was probably never all that good but it meant a lot to Minnie.